Lake Como is considered a chic romantic paradise and is renown for its picturesque iconic sceneries. Few other places will seduce your senses with evocative vistas of the mountains re ected into the shimmering waters, cozy villages do ed with scented owers and lush vegetation, and a plethora of restaurants serving the Lakeâs specialties. Just few kilometers from Como, on the southeast side of the Lake, Villa Pliniana is a waterfront luxury villa di cult to fully describe but certainly impossible to forget. Between the impressive architecture, the lavish interiors, the private spa and the attentive service, the guests who stay at Pliniana will experience much more than a great vacation! The main spaces dedicated to social interaction are two stunning grand salons. These rooms boast excellent original architectural details that evoke the majesty of the Renaissance era. The original decor has been recently restored with great care and excellent craftsmanship: coffered ceilings, historical painted bands, stuccos, massive French doors facing the astonishing scenery of the Lake. The furniture is a mix of modern and traditional pieces blended in perfect harmony to ensure the highest standards of comfort. Security Deposit: Upon arrival, clients are required to sign a document with their credit card details to authorize a charge in case of damages. Additional bedrooms available within the estate available for extra charge. City Tax €5 per day/per person to be paid locally. All extra services must be paid locally, prior to departure, unless other wise arranged. Four connecting apartments in total. All apartments are provided with satellite TV, internet connection, air-conditioning, safe, and a private kitchen with a connection laundry room. All bathrooms are marble and provided with hair-dryers. Private spa: sauna, steam room, emotional showers, indoor swimming pool, Jacuzzi, and solarium. Two grand salons, billiards room, and formal dining room. Commercial kitchen (can only be used by staff). All utilities, including full A/C, heating and nal cleaning. Riva boat available (up to 10 guests) upon request, cost of fuel is extra. Daily Aperitivo hour under the historical Loggia (cost of drinks extra). Wireless broadband internet throughout the villa. Personal chef and staff to serve meals. Cost of fuel for boats charged separately. All incidentals – everything else except the included list specified. 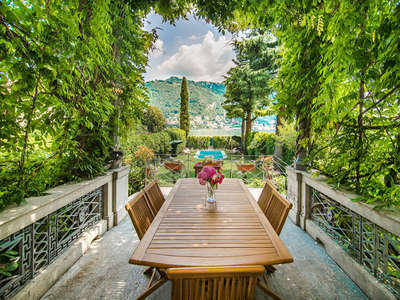 The area of Lake Como is abundant in picturesque towns with narrow cobbled streets, breathtaking views, and lovely homes and gardens, best visited from late spring to early fall. 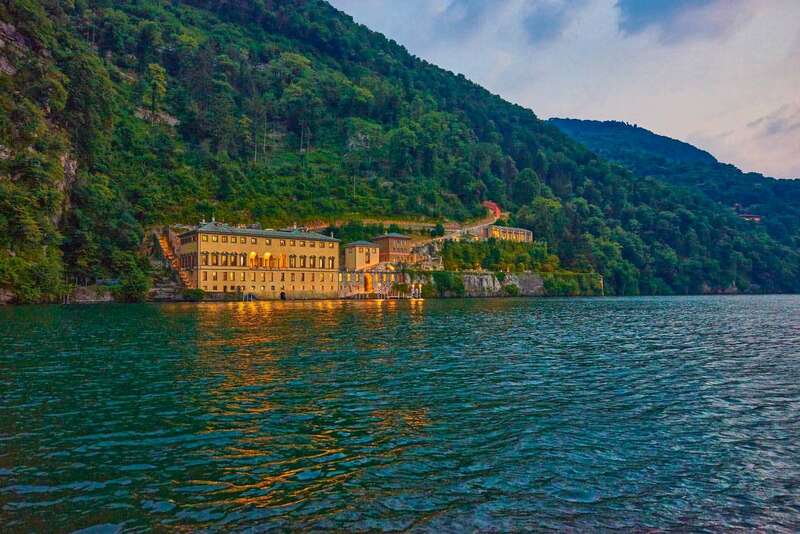 Take a stroll through the city of Como to enjoy its history and architecture, then hop on the ferry and head north to visit other towns on the lakeshore. However, there is more to do in this area than traditional sightseeing. Visitors can book a flight over the lake by seaplane or take the funiculare (hillside trolley) to Brunate and enjoy spectacular views from above. Extreme sports enthusiasts can enjoy paragliding off of Mount Nuvolone. For the more adventurous, Lake Como also offers water-skiing, wind surfing, and wake boarding. Bikers will surely enjoy the natural trails that lead to the mountains or even hidden pebbled beaches. Go for a round of golf or tennis at one of the many locations across the lake region. 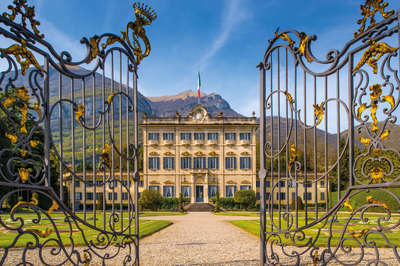 Lake Como has something for everyone! With fashion-capital Milan just 45 minutes away, it's no wonder that Lake Como also offers excellent designer shopping. 60 km from Milano Malpensa Airport.